Do not put your sand crab’s tank near a window or anywhere that gets a lot of sunshine. Because their nervous system is so sensitive, sand crabs can suffer an extremely painful death if they get overheated. Always check to make sure the tank’s temperature is properly set at 75 degrees Fahrenheit. Aquarium sand can be washed every month and reused. You can find an undertank heater at any store that sells fish or reptile pet supplies. Though the sand crabs are sustained by salt water when they live in the ocean, they can adapt to fresh water when living in a home tank environment. Unlike their close cousins, hermit crabs, sand crabs feed in the water, which is impossible to recreate at home in a fish tank. Therefore, if you are going to keep a sand crab at home, you'll have to feed it a sand crab supplement to make sure it is getting the proper nutrition. Sand crabs are tiny invertebrates that live in shifting sand. If you’ve spent any time at the ocean, you probably have seen the small creatures burying into the swash zone, where the waves are breaking. 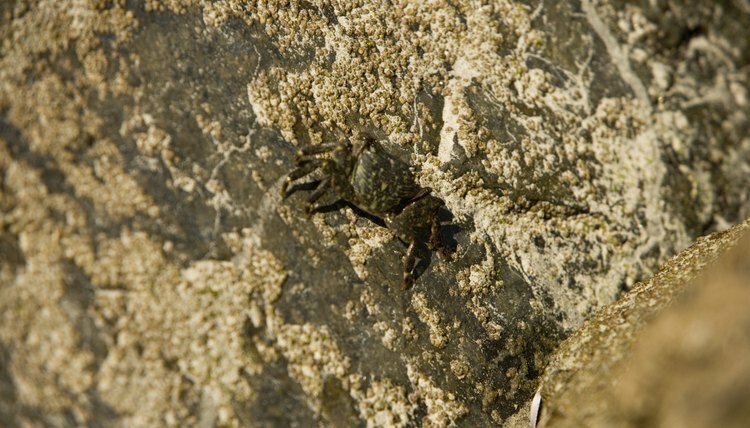 Though small, sand crabs' tails have the largest sensory neurons of any animal. If you capture a sand crab from the ocean and take it home, proper care is essential. Fill a 5-10 gallon fish tank with aquarium sand. Heat the tank to 75 degrees with an undertank heater. Maintain this temperature--ideally at 70 percent humidity--to mimic the natural conditions that your sand crab is used to. Put a wet sea sponge into the tank to increase the humidity if the environment does not naturally sustain a 70 percent humidity reading. Place your sand crabs into the tank and allow them to get used to their new home by burying themselves into the substrate. Furnish the tank with driftwood, artificial plants and coral. Sand crabs like to keep busy and enjoy climbing. Change the location of the items periodically to keep the sand crabs busy and engaged. Place a shallow dish of fresh water into the tank. Check to make sure the bowl remains filled because sand crabs need plenty of fresh water. Feed your sand crabs plankton, which you can find in a sand crab food supplement from the pet store.